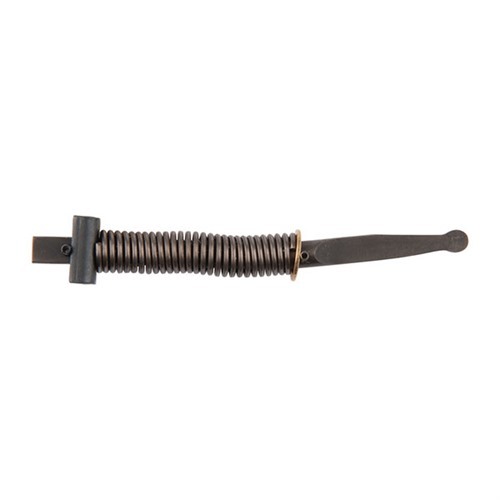 Holds mainspring in alignment, prevents spring kink and binding for consistent hammer drop and improved ignition. Round strut helps provide a confidence-inspiring, smoother feel when cocking. Saves time and effort, eliminates the filing and polishing necessary to remove the burrs and rough edges on the stamped, factory part. Pre-assembled with a 17 pound Wolff hammer spring and ready to drop in. SPECS: Steel. Fits Blackhawk®, Super Blackhawk® and Old Vaquero®. Will not fit the New Vaquero® with the smaller grip frame. Holder hovedkilden i justering, hindrer våren kink og bindende for konsekvent hammer slipp og forbedret tenning. Runde spankulere hjelper gi en tillit-inspirerende, jevnere føler når cocking. Sparer tid og krefter, eliminerer innlevering og polering nødvendig å fjerne grader og ujevnheter på stemplet, fabrikken del. Forhåndsinstallert med 17 kilo Wolff hammer våren og klar til å slippe inn. Spesifikasjoner: stål. Passer Blackhawk ®, Super Blackhawk ® og gamle Vaquero ®. Ikke passer de nye Vaquero ® med mindre grepet rammen. Being a captured spring, removal of the old and installation of the new is easy. A tiny drop of oil on the round end where it meets the hammer helps. Still plenty of spring power compared to the stock 24 pound spring to reliably ignite the hard primers of .45ACP GI rounds. This will also take off about 2 pounds of trigger pull due to reduced pressure on the sear surfaces. Bought this to replace the Ruger factory part that was a joke. The head of the strut was poorly ground and had flat facets on it. I made an attempt to smooth it, and it did help some, it was still somewhat "gritty" feeling when cocking. I also didn't care for the wear patterns of the flat shank that the spring rode upon. This Brownell's part having a smooth consistent finish over the entire part has made a world of difference in and of itself. The head is smooth and well polished which aids in smooth, consistent cocking. The body being well rounded has no edges or corners to snag the spring improving the overal general feel of the revolver. My trigger pull has gone from a gritty 5 lbs to a crisp, clean 3.5 lbs. Cocking the revolver is smooth and easy though for my tastes the 17lb spring is a bit light. I replaced it with a 19lb Power Custom spring. I have been tempted to try out the factory spring to see how smooth it feels. This part works great. I have a limited edition "Flat Top" Bisley .44 special. 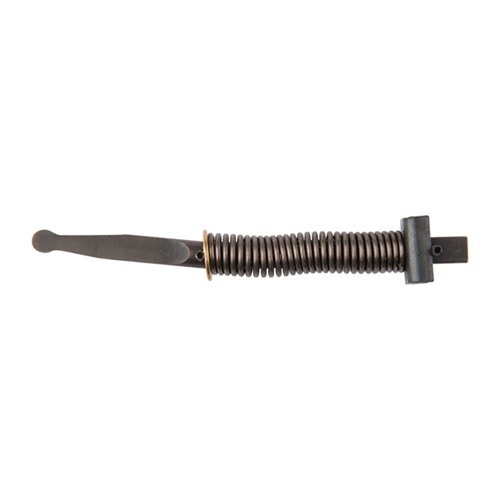 The stock mainspring was way to heavy resulting in a significant effort to work the hammer back along with heavy hammer fall that tends to jar the sight alignment on impact to the firing pin. This drop in part works as advertised---easy to install and makes a big difference in level of effort to work the hammer and smoothness of the hammer fall. I've had no issues with "light strikes" I handload all my ammo with Federal primers. Combine this part with a Wolff 30 ounce trigger return spring and you'll have a decent trigger. Buyer beware--this part may not work on the limited edition XR-3 frames with the modular trigger lock inside the grip frame. Ruger® Round Hammer Strut 050806104952 Holder hovedkilden i justering, hindrer våren kink og bindende for konsekvent hammer slipp og forbedret tenning. Runde spankulere hjelper gi en tillit-inspirerende, jevnere føler når cocking. Sparer tid og krefter, eliminerer innlevering og polering nødvendig å fjerne grader og ujevnheter på stemplet, fabrikken del. Forhåndsinstallert med 17 kilo Wolff hammer våren og klar til å slippe inn.